I hope everyone had a great Thanksgiving. I spent it with my family up north. The kids did very well on the 14 hour drive up. Thank goodness. I got to catch up with friends and family. Had a few date nights with the hubby since mom was available to watch the kids. It was fun, but the cold weather wasn't. I was glad to come back to my new home down south. I don't regret the move. I even drove by my old house to see if I missed it and I didn't. I certainly don't miss the kitchen, my new one has so much more room to work in. Even though the M&Ms were a bit broken, I broke them up a little more to make more bit sized pieces. I love how easy and fast this recipe is to put together. 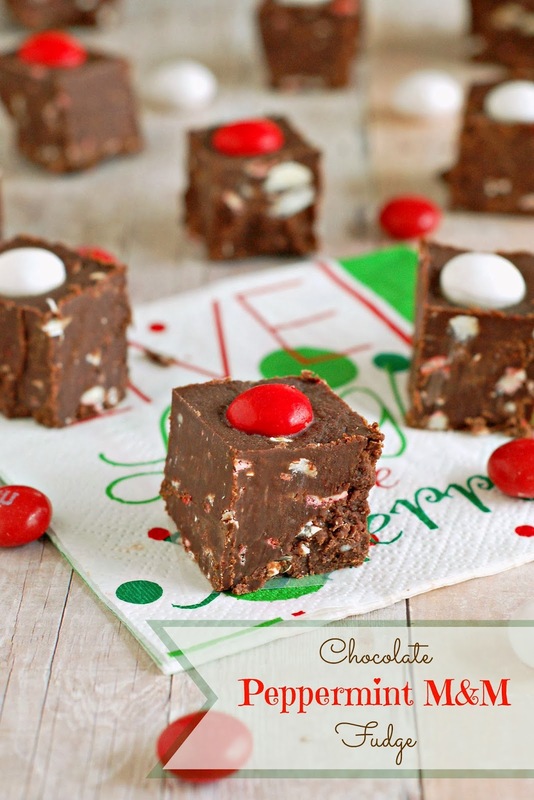 Just melt the chocolate with the condensed milk, then add the M&M's and Peppermint Pigsy Dust. Ahh..peppermint...the smell of Christmas. 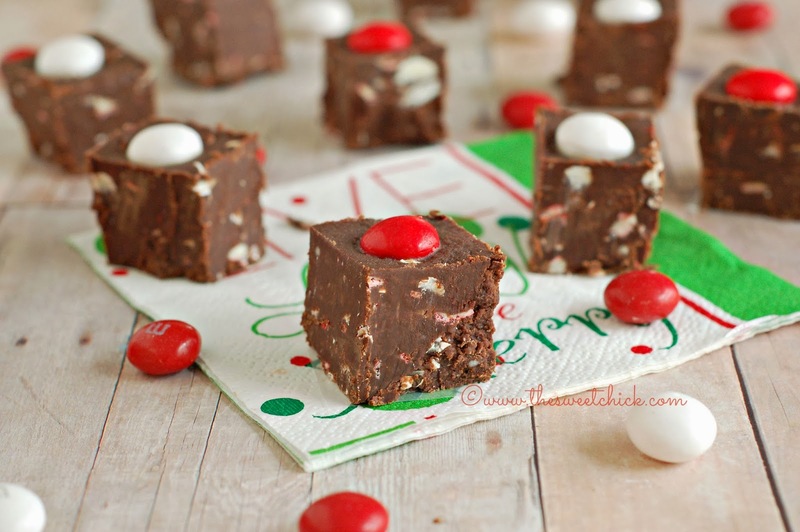 I know not everyone loves peppermint, but those that do will love this fudge. I dressed up the top of the fudge with additional M&Ms. I think it looks pretty festive. I do like the combination of the white chocolate and peppermint in the M&Ms with the chocolate. This fudge would be great all dolled up in a box and given as a gift to a fellow peppermint lover for the holidays. In a medium saucepan over low heat, melt the chocolate chips and milk until smooth. Remove from heat, stir in the M&Ms and Pigsy Dust until completely incorporated. Then spread the mixture evenly onto a parchment paper lined 8″ x 8″ pan or glass dish. If you wish, place additional M&M's evenly across the mixture, pressing gently to make sure they adhere. Remove from fridge and gently lift the parchment paper to remove the fudge from the pan. If the fudge is too hard to remove, let it sit out a room temperature for about a half hour and then remove it from the pan and slice it into squares. Note: If you want straight edges, use a sharp knife and clean it after every cut. I also slice off about a quarter inch around the entire perimeter to get better squares. But don't waste the slivers, keep them in the fridge and add them to your coffee or hot cocoa.